whose business acumen made Galveston the 'New York of the Gulf' in the late 19th Century." Fortunately, some of these elegant mansions survived the devastating hurricane of 1900 and were restored to their original grandeur. Three of them, collectively referred to as the "Broadway Beauties," are open for public tours most of the year: Ashton Villa, Bishop's Palace, and Moody Mansion. 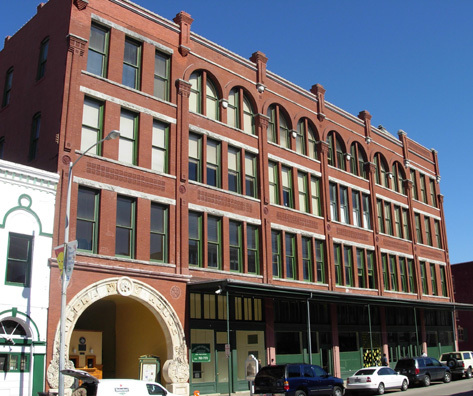 All are designated Texas Historic Sites and are on the National Register of Historic Places. 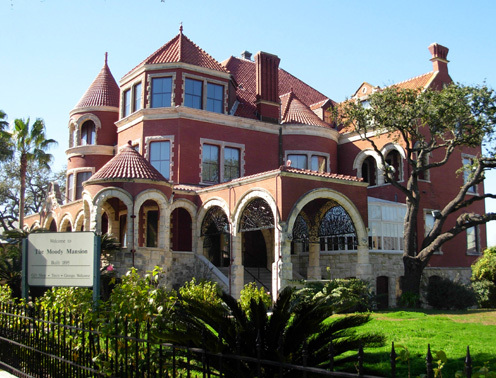 In the last entry you saw some beautiful examples of the rich architectural and cultural heritage in Galveston's residential neighborhoods. Those homes are "rich" in character, but not nearly as lavish as the mansions on Broadway. 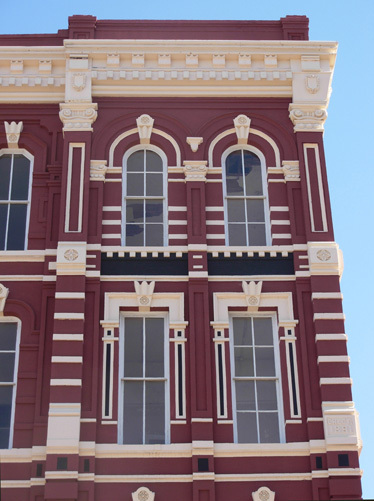 In this entry I'll give you a little history of the three "Beauties," then show you examples of some outstanding commercial and public buildings in Galveston that further exemplify the city's eclectic range of architecture. Jim and I didn't tour any of the mansions on this trip. I took exterior photos and have gathered some interesting information about the homes that I'll share with you (from the official brochures of each home, our old AAA TourBook of Texas, and internet research). For interior photos of the sumptuous interiors and furnishings in these homes, check out some of the links you'll find if you do an internet search or contact the Galveston Historical Foundation for brochures. 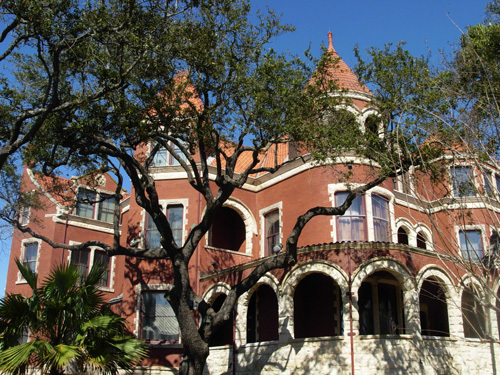 Ashton Villa, one of Galveston's few remaining pre-Civil War houses, was the first "Broadway Beauty." It was built at Broadway and 23rd in 1859 for James Moreau Brown, a prosperous hardware merchant, railroad corporation president, and banker. Although Broadway at the time was only an unpaved dividing line between in-town neighborhoods and larger lots toward the beach side of the island, the home would set the standard for the magnificent mansions that were built in the next several decades. Brown used a stock plan for an Italianate-style suburban residence from a book -- unlike the other two mansions that were designed individually by renowned architects. Even so, it ended up rivaling the governor's mansion in Austin in expense, elegance, and modern conveniences ("modern" being relative! ), according to the Ashton Villa tour brochure. The opulent antebellum house was one of Texas' first brick mansions and featured ornate cast-iron porches, indoor plumbing, "gasolier" lighting, and elaborate carved moldings and mantel-work. It was a popular place for elegant weddings, receptions, and dinners. 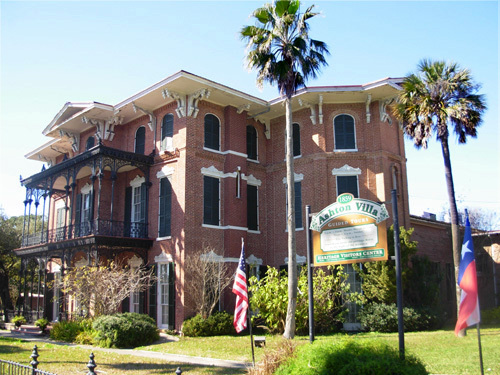 Ashton Villa survived deep flooding and served as a refuge during the great hurricane in 1900. 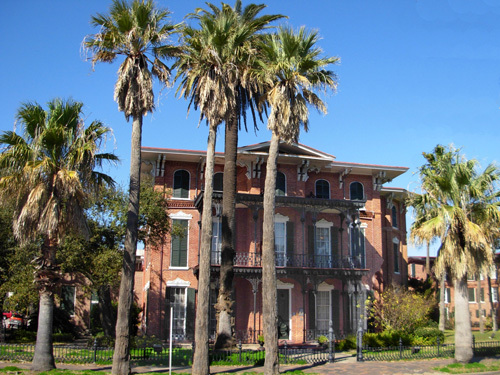 It passed out of family hands in the 20th century and was saved from the wrecking ball in 1971 by the Galveston Historic Foundation, which restored the home to its original grandeur. The three-story mansion is filled with beautiful period antiques, art, and Moore family heirlooms, including paintings by Brown's oldest daughter, "Miss Bettie," Rebecca Ashton Brown. 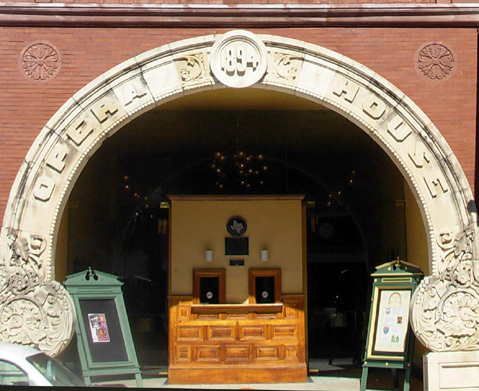 The carriage house at the mansion also serves as Galveston's Heritage Visitors Center, where you can obtain information about all the historical attractions on the island. 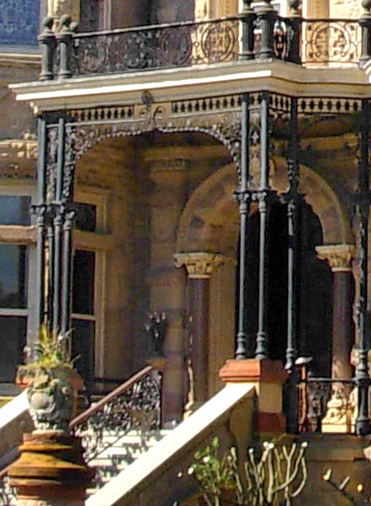 The other two "Broadway Beauties" are larger, more elaborate, and took longer to be built than Ashton Villa. Both were completed in the 1890s and survived the Great Storm of 1900. 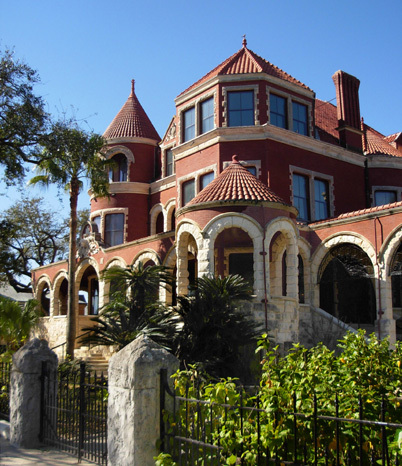 Moody Mansion "depicts the home life of a powerful Texas family," according to its web site and brochure. "The Moodys established one of the great American financial empires. Based on cotton, it grew to include banking, ranching, insurance, and hotels." 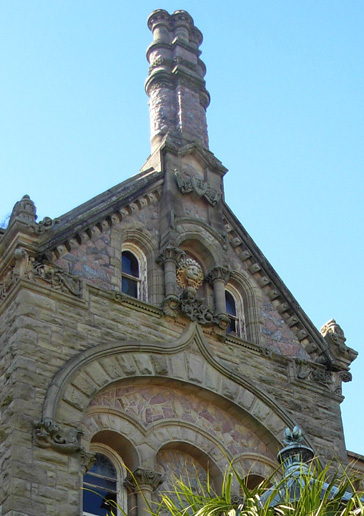 The Richardsonian Romanesque-style (late Victorian period) mansion was originally designed by William H. Tyndall for Mrs. Narcissa Willis -- not the Moodys. The 28,000 square foot, four-story house was completed in 1895, only five years before the devastating hurricane. A reason it survived the storm may be that it was one of the first homes in Texas to be built on a steel frame. The beautiful 32-room interior was designed by the firm of Pottier and Stymus, which can also claim the White House among its clients. Interior features include magnificent stained glass windows, ornate plaster details on the walls and ceilings, rare hand-carved woodwork, and elaborate tiles and stenciling. W.L Moody Jr. and his wife, Libbie Shearn Moody, bought the home from the heirs of the original owners soon after the great hurricane of 1900. Mr. and Mrs. Moody and their four children celebrated the first of more than eighty Christmas seasons in the house in December of that year. The house remained home for Moody family members until 1986. Mary Moody Northen was the last family member to reside here. Today, Moody Mansion's rooms are filled with the furnishings and personal affects of the family. Twenty rooms on three floors are open to the public. Each room is decorated in a different style. You can see some interior photos on the home's web site or do a search for other sites. The philanthropic legacy of the Moody family of Galveston is carried on today by the Moody Foundation and the Mary Moody Northen Endowment. Both charitable foundations are major forces in health care, education, historic preservation, and the arts. The Moody Foundation has developed a popular educational and entertainment complex called Moody Gardens on the west end of the city. It includes a tropical rainforest, aquarium, white sand beach, freshwater lagoon, waterfalls, IMAX theatres, discovery museum, hotel, spa, convention center, and other activities. We didn't visit Moody Gardens on this trip. 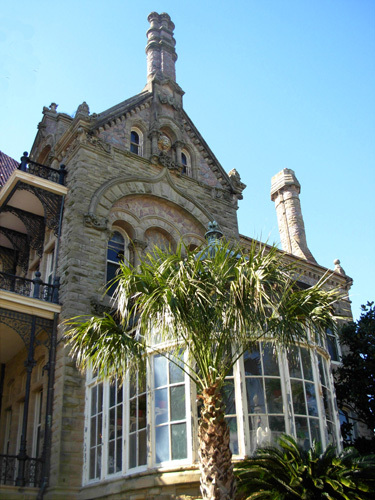 The official Bishop's Palace brochure declares this is "the most famous architectural wonder in historic Galveston." Since I haven't been inside, I can't vouch for this assertion: "Architectural experts point out only one other structure of Victorian design is comparable to the palace -- the Biltmore House in Asheville, NC." Hmmm. Not sure I'd go that far. I've been to the huge Biltmore House, inside and out, and I don't think you can compare ANY other estate in the USA with it. It's totally in a class of its own. 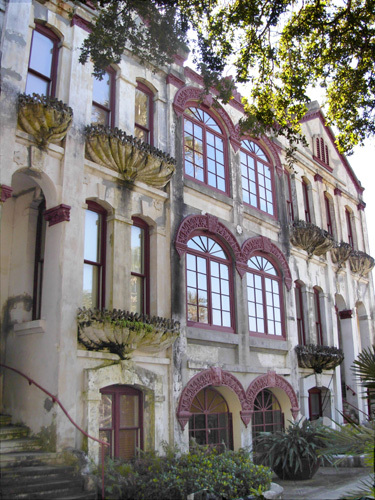 But I was fascinated with the grand French medieval-style exterior of the Bishop's Palace and hope to tour the interior on our next trip to Galveston. It sounds very elegant inside. 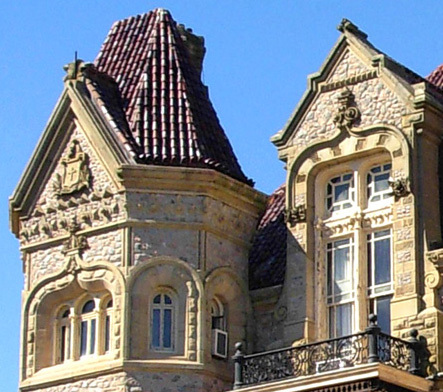 Originally known as "Gresham's Castle," this elaborate house was built for Colonel Walter Gresham, a wealthy attorney and congressional representative who helped found the Gulf, Colorado, and Santa Fe Railway. It was built over a period of seven years from about 1886 to 1892 at an estimated cost of $250,000. Imagine what it would cost to build today!! The home was designed by Nicholas Clayton, a prominent architect in Galveston who designed some of the most interesting buildings in the city (I'll show you more in a bit). 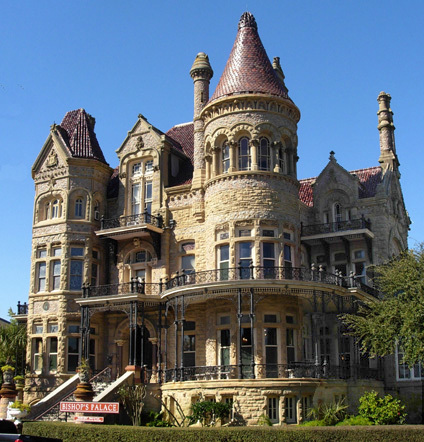 The mansion is built with native Texas pink and blue granite, white limestone, and red sandstone, all cut and shaped on the site. Colonel Gresham spared no expense when building this mansion, often choosing luxury materials. For example, he obtained impressive fireplaces from around the world, then built rooms around them. One mantel and fireplace are lined in pure silver. Another mantel won first prize at the Philadelphia World's Fair in 1876. Other elegant and/or imported furnishings include a crystal chandelier from Venice, a slate fireplace from Italy, jeweled glass windows, a hand-carved grand staircase, and silk damask wall coverings. Many rare woods like rosewood, satinwood, white mahogany, American oak, and maple were used for the interior, hand-carved woodwork and intricate ornamentation. After reading all that, I HAVE to see inside this house next time! Not that I would ever want to live like that -- my tastes are MUCH simpler -- but I appreciate fine period furnishings. OK, Sue, why is the place now called the Bishop's Palace? What happened to the Greshams? I haven't researched THAT far. All I know is that the house was purchased by the Galveston-Houston Catholic Diocese in 1923 for Bishop Christopher Byrne, who lived there until he died in 1950. That's how it got the name "Bishop's Palace." Bishop Byrne was the last person to live in the mansion. Now the house is open for tours. 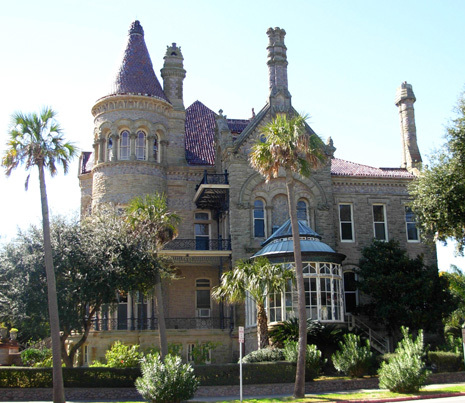 Proceeds are used to maintain the palace and support the Newman Center of the University of Texas Medical Branch and Galveston Community College. There is a religious bookstore, souvenir shop, and ticket office at the Bishop's Palace. Now let's look at two interesting neighbors of Bishop's Palace . . . 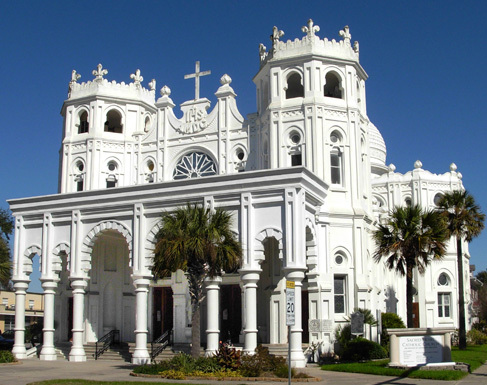 I was drawn to the magnificent church featured on the poster for Galveston's 13th annual Tour of Sacred Places in the Historical Foundation's headquarters before seeing the cathedral in person, the Sacred Heart Catholic Church. I was impressed and put it on my mental list of "must-see" historical buildings. Sacred Heart Catholic Church at Broadway & 14th. The front faces 14th. 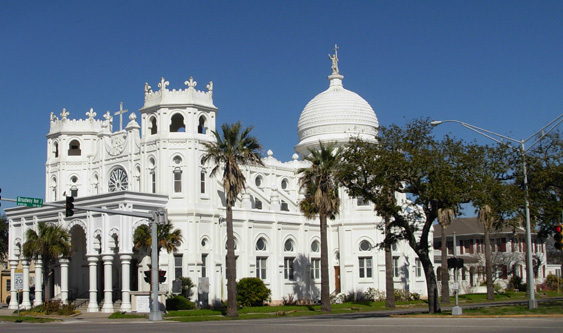 As I mentioned in my entries about the old Catholic Spanish missions in San Antonio, you don't have to be Catholic -- or any other religious persuasion -- to appreciate the history and architectural beauty of well-designed churches, cathedrals, temples, mosques, etc. I often find them as interesting as any other well-designed building. If you're Baptist or Mormon or Buddhist or atheist or whatever, I hope you enjoy the photos of this church and another one that I'll include shortly. I'm sorry we left before the Tour of Sacred Places was scheduled; I'd like to see inside some of the featured churches. This is the Broadway side of the church. The parish house is in the rear. The history of this parish and church is interesting. Sacred Heart built its first church on this site in 1892. At the time, it was the largest church in the state of Texas. 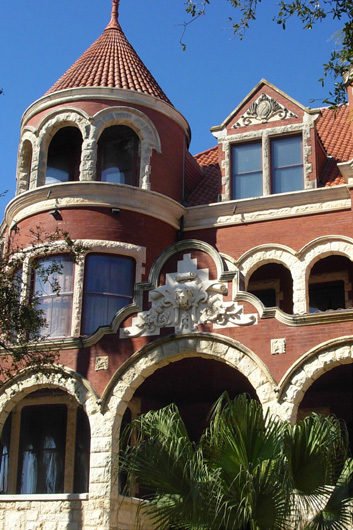 The ornate French Romanesque building was designed by renowned Galveston architect Nicholas J. Clayton, who you'll recall is the architect who designed Bishop's Palace right across 14th Street. From the web site: "However, the life of this impressive structure was short-lived, and on September 8, 1900, a storm that became the worst natural disaster to ever strike the United States, demolished the building. The destruction was complete except for two stained glass windows, the Mass bell, the statue of the Sacred Heart and the Crucifix which remains in the present day church. 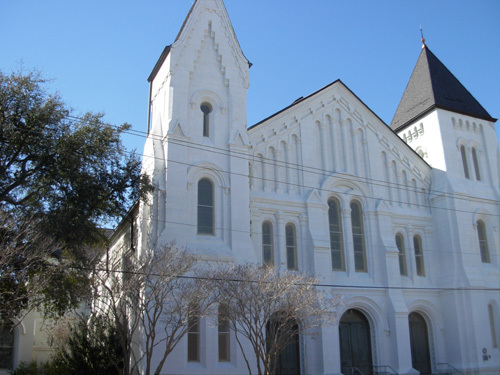 The parish family immediately made plans to replace their building. The present structure was designed by a Jesuit brother named Jimenez. The cornerstone was laid on June 21, 1903 by Bishop Gallagher and the church was consecrated on January 17,1904." 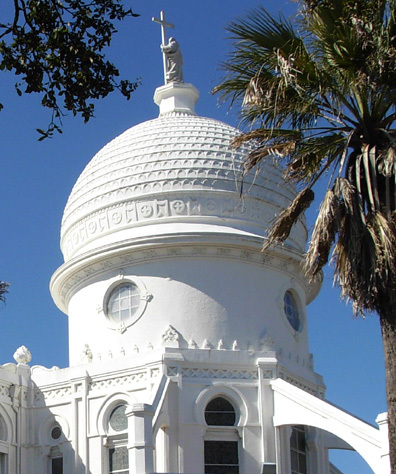 "The 1915 storm destroyed the dome of the church and Nicholas Clayton designed the present onion-shaped protuberance which graces the building today." "The statue of the Sacred Heart which survived the 1900 storm was atop this dome until 1948 when once again a storm took its toll and the statue was struck by lightning. 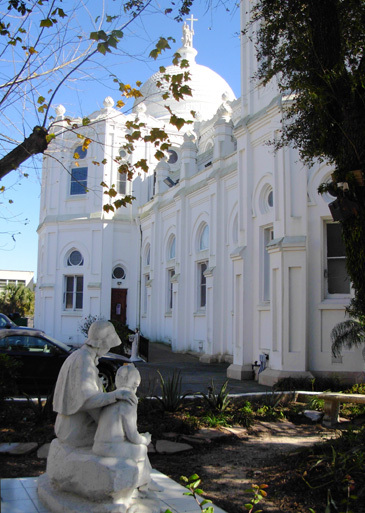 The parish ordered the Carrara marble replica of the Christ of the Andes which was placed on the dome in 1950. [shown above, from the rear] Designed in Clayton's architecture, natural light floods in from the dome and adds majesty and impressiveness to the Carrara-marble altar below. Covering the front of the altar is a large and lifelike representation of da Vinci's Last Supper in pure white marble." If you want even more details about this impressive church, see the web site. There is a photo gallery with pictures of the original church after the 1900 storm demolished it, as well as photos of the interior, some of the large stained glass windows, statues, etc. Clayton appears to have been a very busy (read: successful) architect. I photographed four impressive buildings he designed in Galveston, and that's only the tip of the iceberg of what this prolific Irish fellow created. Check out the photos of some other buildings he designed at this web site. While I was fiddling with the angle of that photo, a woman drove up and began a conversation with us. She needed to take a picture, too, as a gift for a young couple who is getting married in the church. We got to talking about all sorts of things to see in Galveston when she shared information about a professional photographer in town that has beautiful photos of Sacred Heart Church (and other buildings in Galveston) at sunrise, sunset, etc. Check out Robert John Mihovil's beautiful "photographic watercolor prints" here (scroll down to churches, if you can tear yourself away from his other gorgeous pictures). 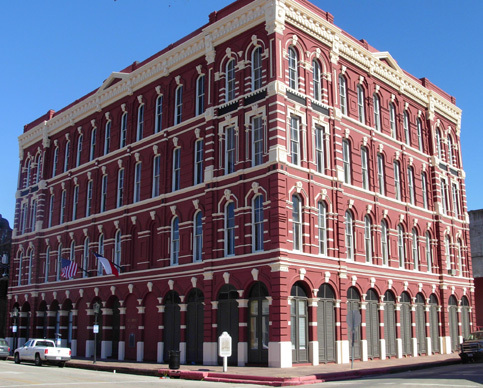 The Galveston Historical Foundation (GHF) has made a concerted effort since the 1970s to save the unique collection of 19th century cast-iron fronted commercial and government buildings in the city�s downtown area. The Strand, formerly called "The Wall Street of the Southwest," is a National Historic Landmark District with protective restrictions. It was here that financial good fortune in this bustling seaport was equated with architectural display. 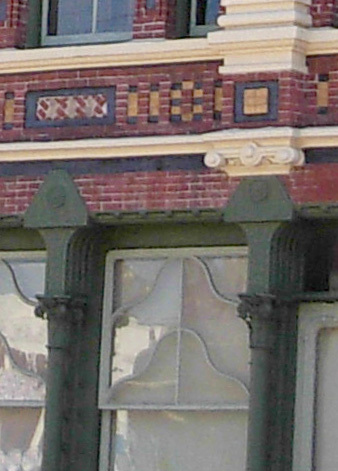 The 1900 hurricane changed the fortunes of many businesses and individuals in Galveston, however. After the devastation wrought by the storm, the huge cotton and other commodity trades moved to safer, more inland ports and downtown Galveston businesses suffered for the next seventy years until concerted efforts were made to revitalize the Strand. The Strand Historical District stretches east-west from 20th to 25th Streets and north-south from Harborside Drive to Postoffice Street. It is north and west of the adjacent East End Historic District. Successful renovation in The Strand over the past thirty-plus years has expanded to other streets downtown, making it a desirable place to visit again. There are lots of retail shops, restaurants, and arts and entertainment venues along these streets, as well as offices and government buildings. I showed two photos from the Strand at the beginning of the last entry. Here are a few more prominent buildings in this area. 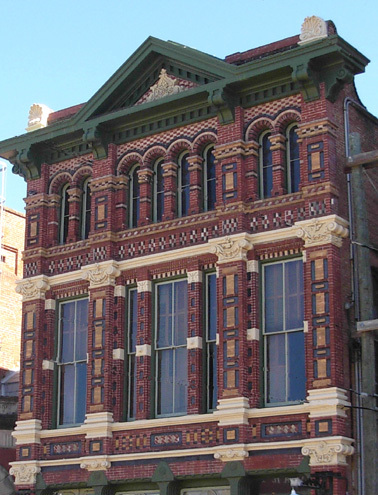 The Grand 1894 Opera House at 2020 Postoffice Street is a survivor of the Great Storm that devastated much of Galveston in 1900. The Romanesque Revival-style theatre was repaired and reopened fairly quickly after the hurricane, as well as other significant storms in 1915 and succeeding years. It has been through several periods of neglect, too, but was fully restored between 1974 and 1990 and continues to draw nationally-known performers. The 1861 U.S. 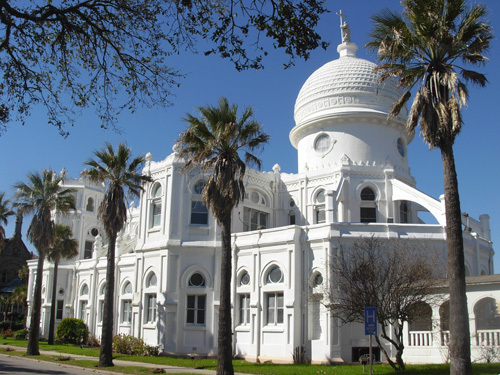 Custom House, shown below, is one of the oldest and most elegant public buildings in Galveston. 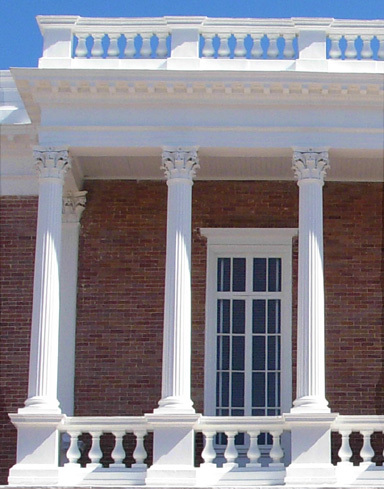 Its Greek Renaissance Revival style includes many original classical decorative features on its exterior (Corinthian and Ionic columns, cornices, balustrades, dentil molding, etc.) 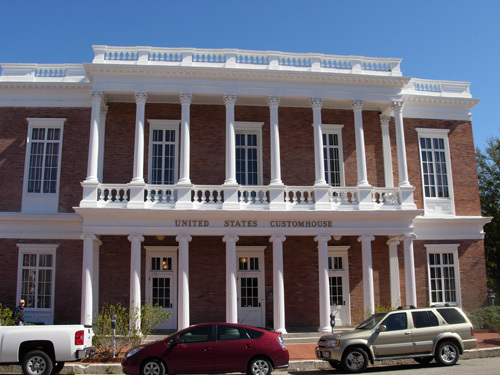 despite several remodelings inside the building as it morphed from custom house to Confederate Post Office (Civil War) to U.S. Courthouse to Post Office again to headquarters, finally, of the Galveston Historical Foundation. Pretty versatile place! The sturdy cast-iron and brick structure survived not only the 1900 hurricane, but also an explosion, a war, several attempts to remove and alter it, and an extensive fire in downtown Galveston in 1885 that destroyed many wooden buildings (that were replaced by brick ones). It has been called the "Lucky Landmark." It is on the National Register of Historic Places. What we saw of the bright, spacious interior of the Custom House is as attractive as the outside. You can see photos of the exterior and interior at the GHF web site and read more about its interesting history and architectural details. A handsome example of Italian Renaissance Revival is the four-story brick Stewart Building designed by architect Eugene T. Heiner. It was built in 1882 for Julius Kaufman and Julius Runge, who ran a large cotton export and coffee import business. Since 1905 the building has contained offices for Stewart Title Company. The only other commercial building of architectural significance that I photographed is the Victorian Romanesque Trueheart-Adriance Building designed by Nicholas Clayton (there's that name again!). Of course, there are many more -- I just ran out of time to photograph the others. A web search of Galveston or The Strand will net you many more pictures of interesting buildings there. That's a "busy" design, but I like it. At the risk of sounding like I'm on the payroll for the local tourism board, I encourage readers to visit Galveston's delightful historical districts and take time to walk up and down a bunch of the streets. 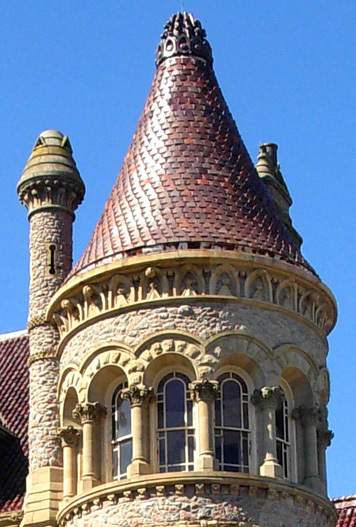 See how many interesting architectural details you can spot, like stained glass windows, "gingerbread" trim, colorful paint combinations, turrets and towers, and on and on. You can also see the "big picture" on a driving tour but you'll miss a lot of little details and the signs in front of many of the houses and other buildings. In addition to the beautiful and varied styles of architecture, much of the landscaping is gorgeous -- several kinds of tropical flowers in bloom year-round, palm trees reaching for the sky, graceful 20-foot Norfolk Island pines, sprawling live oak trees with branches that twist and turn. 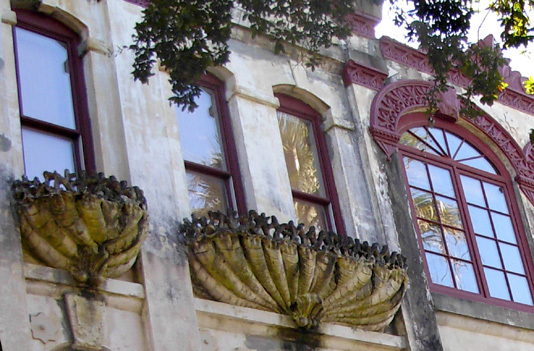 Galveston is a visual, sensual, historical delight. You can get by inexpensively like we did, without going inside any of the buildings that charge a fee, and still get a good feel for the city. Or you can enhance your experience by taking more time, spending more money, and enjoying some tours. I want to do that on our next trip there, as well as exploring some of the maritime attractions like the seaport museum and ship tours. Next entry: just about as far removed figuratively from historic Galveston as you can go -- into outer space at the futuristic Johnson Space Center!